A guide to going to the bathroom while camping, featuring products that will make your outdoor bathroom experience comfortable, sanitary and environmentally friendly. If you enjoy the great outdoors, you understand the downside of relieving yourself while away from the luxury of indoor plumbing. For many, it’s one of the most dreaded aspects of going off-the-grid. 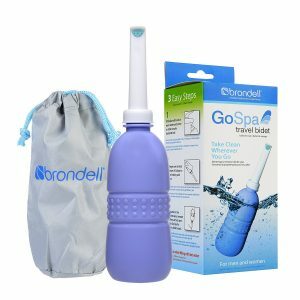 Fortunately there are some great products that make going to the bathroom while camping comfortable, sanitary and environmentally friendly. First, it’s important to know the basics. Since urinating or defecating in public places is against the law, you have to be sure to remain completely out of sight. Here are some other tips for using the bathroom on public land. You must be at least 200 feet from a body of water, trail or campsite. Dig a hole at least 6 inches deep for waste. Carrying a small hand trowel will make it easy to dig the hole and cover the waste to avoid any possible contamination. Be prepared with biodegradable toilet paper when possible, along with a ziploc bag to deposit paper products to take back to camp to dispose of properly. Tip: Take some hand sanitizer. If digging the “cathole” just isn’t your thing, there are plenty of products available to make your outdoor bathroom experience less challenging, while still remaining in your budget. Pros: A very affordable toilet option. 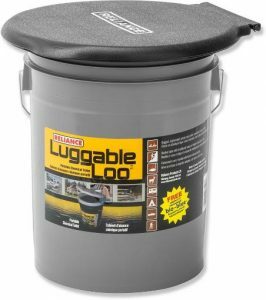 This 5 gallon bucket is compatible with Double Doodie Toilet Bags or standard trash bags which means there is no clean-up necessary and stays sanitary. Supports up to 350 pounds. Cons: A bit on the bulky side. It doesn’t fold up and the plastic seat hasn’t been reported to be very durable. Pros: An affordable and comfortable toilet option. Folds completely flat when not in use, and can support up to 250 pounds. 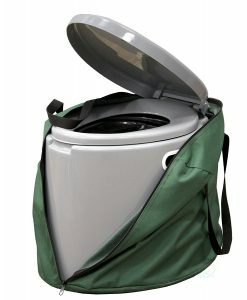 An 8 gallon bag can be draped over the seat, so it remains completely sanitary during and after use. Compatible with products like the Double Doodie Toilet Bags. Cons: Bags not included and must be purchased separately. Will not fit in a backpack, not recommended to carry on a hike. Pros: Very similar to a real toilet, with a full size seat and an integrated toiler paper holder. The removable lid seals in odor, and you can use with or without plastic bags. Doubles as a seat when not in use and comes with a nylon travel bag for easy transport. Weighs approximately 5.5 pounds and can support up to 250 pounds. Cons: Since it mimics a full size toilet, this isn’t designed to be carried on a hike. 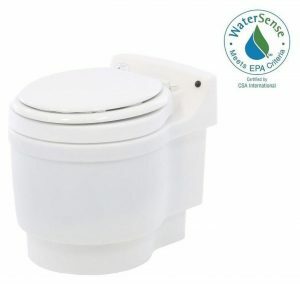 Pros: This toilet does not use any chemicals or water and is 100% odorless. When flushed, the bag is automatically wrapped around the waste and stored at the bottom of the container. Nothing to see or smell and ready for use again in 30 seconds. Cons: An innovative product that does not come cheap. One of the most expensive portable toilets on the market, but certainly worth the investment if you want an eco-friendly, minimal cleaning toilet. It is battery operated and you must use their refill cartridges. 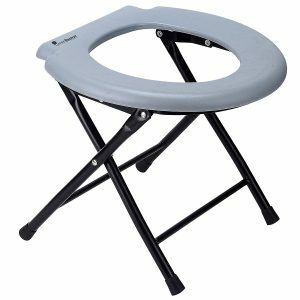 Pros: A really affordable and portable option for going to the bathroom outdoors. Fits in most bags and eliminates the need for toilet paper. Cons: Must be filled with water. If you’re carrying this in a bag, there is potential for water leaking out the air hole on the bottom. Pros: Although this wouldn’t qualify as a “toilet,” this is the most portable option if you’re away from camp. 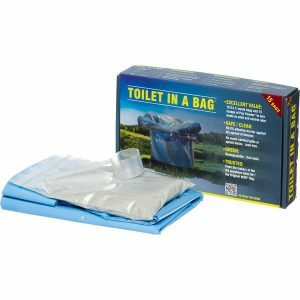 Great for hikers or backpackers who don’t want to haul around a toilet on their adventure. These bags come with a scoop of Poo Powder that controls odor and turns any liquid waste into a solid. Cons: Without a toilet seat, you will have to go to the bathroom and then scoop it into the bag, or somehow manage to go directly in the bag. It is biodegradable, but must be disposed of in a trash can. The uncertainty of going to the bathroom while camping shouldn’t have you holding it in until you’re back in civilization. The toilet options here are just a few of the products that may fit your budget and specific bathroom needs while camping. Responsible human waste management shows you are respecting Mother Nature, even when there’s no public facilities (or people) around.